Friends remember Caitlin with Celtic and Rangers shirts. INPT21-236. The community in Portadown has mobilised to address the scourge of drugs, after the tragic death of teenager Caitlin White (Shortland). Caitlin (15) was found unconscious in woodland at Corcrain on Saturday night and died later in hospital. Some of the people who attended a meeting on the drug problem in Portadown which was organised by Portadown Cares and was held in Portadown Town Hall. INPT22-202. Police are investigating a possible link to drugs. Representatives from community, residents and youth groups from both sides of the religious divide attended a meeting in Portadown Town Hall last night (Thursday). 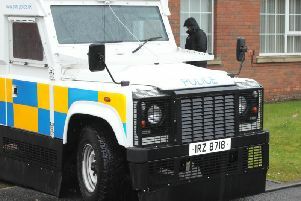 It was organised by community charity Portadown Cares, following calls for a co-ordinated, cross-community approach to the problem. A Portadown Cares spokesperson said the meeting had been very productive. “A steering group has been formed and we are meeting to put a strategy in place,” she said. A budget of £20,000 is also to be set aside to tackle risk-taking behaviour in young people, after the issue was raised at a meeting of Armagh City, Banbridge and Craigavon Borough Council on Monday night. Councillor Darryn Causby said there had also been a request for a task force to be set up. Since the incident, there has been criticism of the lack of facilities in the Corcrain area for young people and of the “lack of hope” in the estate. Campbell Best, of the Y-Zone, who has been working with young people in the area, said that since the community centre and two of the shops closed, the estate had “lost its heart”. There are plans to turn one of the empty shops into a youth facility but that has been stalled after asbestos was found. Mr Best, who along with his outreach team and police had conducted a successful drop-in event with young people in Corcrain the night before the tragedy - where he spoke to Caitlin - said they will be back this weekend again. Phyllis Millington, a co-ordinator for Bannside Community Group in Obins Street, said both communities need to come together and formulate a joined-up approach. DUP Westminster candidate David Simpson has called for more youth engagement. He said, “I would like to see a youth forum set up which focuses solely on young people and their needs. A group taken from all walks of life and sections of our community. On Thursday, June 1, a community information evening, which is open to the public, will take place at the Seagoe Hotel at 7pm, organised by Portadown Cares. It will be held in conjunction with Start 360, a support service for young people. There will be practical information on what drugs looks like, signs to look for that young people have taken drugs, and advice for parents on managing children in difficult and challenging situations.